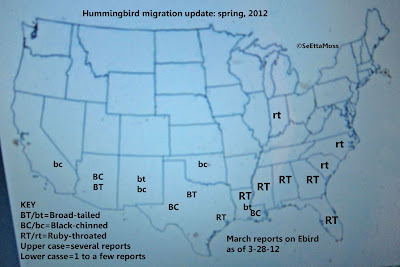 I put together the map below to show which states Ruby-throated, Black-chinned and Broad-tailed Hummingbirds have been reported on Ebirds. I choose the most widespread hummingbird species seen in the U.S. with one exception. I did not put Rufous Hummingbirds on this map since so many of them overwintered in various parts of the U.S. making it difficult to discern if reported birds were migrating in or had been around.